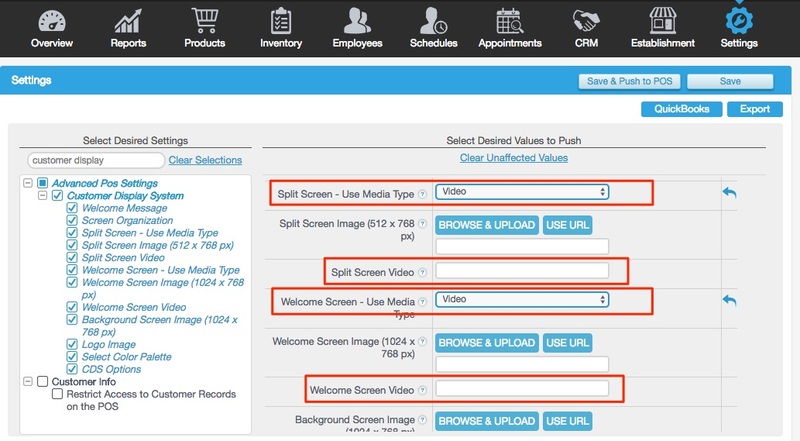 It's now possible to link your Customer Display Screen to YouTube videos. This is helpful if you want to display promotional material on the CDS. Both full screen videos (displayed when the CDS is idle) and half screen videos (displayed on the left side of the CDS in Split Screen Mode) are supported. Type customer display system in the search box. Check the box in the left side menu so the actual settings appear on the right side of the screen. Then, from the Split Screen- Media Type field and/ or Welcome Screen- Use Media Type field, select Video from the drop-down. Then, enter the link in the Split Screen Video field and/ or the Welcome Screen Video field. Please note: If the video cannot be played, the CDS will default to the Split Screen Image or Welcome Screen Image.